Chicago, IL - In a sermon on the festal Gospel lesson, His Grace Bishop Longin said, "…On this day, the fiftieth after Easter, we celebrate the Feast of Pentecost when the fullness of the Holy Trinity was revealed through the coming of the Holy Spirit. Christ taught disciples humility and purity of heart, and then when they were ready, He sent down from His Father the Holy Spirit. This humility and purity of heart, crowned by the Holy Spirit, is the key to understanding, it is Wisdom. 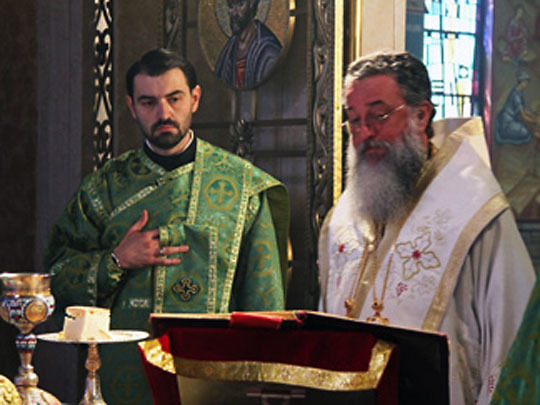 Today we concelebrate the Feast with the Apostles and the Fathers, the Martyrs and the Confessors, of the past and the present age and of the age to come…"
Concelebrating the Hierarchical Divine Liturgy with His Grace Bishop Longin were Protopresbyter-stavrophor Dennis Pavichevich, Presbyter Darko Spasojevic, Cathedral Dean, Presbyter VasilijeVranic, and Deacon Dr. Damjan S. Bozic. Choir responses were beautifully sung by Cathedral choir, Serbian Singing Society “Branko Radichevich” under the directorship of Miss Jelena Stojakovic. In response His Grace Bishop Longin said, "the Cathedral in Chicago has always been dear to me and here I feel as in my own home. This parish with young clergy and executive board members who love their Church and are loyal to her will serve as an example to our parishes in our God-protected diocese. You will bring a new energy to our diocese and only together, in the spirit of love and truth, can we progress as a Church." The Holy Assembly of Bishops of the Serbian Orthodox Church at its meeting in Belgrade added the widowed Metropolitanate of Libertyville and Chicago to the Diocese of New Gracanica and Midwestern America, with His Grace Bishop Longin as Archpastor of the united diocese.